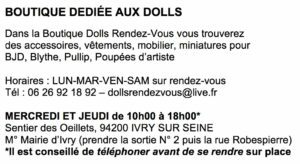 Those interested in participating in the Customization Contest must send the participation form to: dollsrendezvous@live.fr before November 15, 2018 along with photos of their custo doll, the dimensions of this one and, if this is the case, those of the decoration. Photos should be of high quality in order to appreciate all the details of your creation (size of 880×590 pixels, JPEG format). These elements can be used at any time and any place. If you do not agree that your information is published, please let us know in writing. BJD, Pullip, Blythe and Artist’s dolls can be presented in the competition and their outfits, decorations, etc. must respect the theme. Votes: A ballot will be given to visitors who have paid the entry fee. To allow the public to vote for their favorite creation, a number will be assigned to dolls presented in the Contest. A gift, courtesy of one of our partners, will be awarded to the Contest winner. Please note that the prize will not be sent, it must be recovered on-site by the winner. The installation, transport, equipment, monitoring and storage remain the responsibility of the contestants who should arrive one hour before opening to the public and remain until the close of voting. The electricity connection is not assured, it is recommended to bring lamps, batteries, etc. Careful placement of your creation is required. Dolls Rendez-Vous Paris disclaims any liability for damage to your equipment, whatever is the nature.